Songs of Eretz Poetry Review is pleased to reprint “First (Last) Kiss” by Sierra July. Ms. July is a University of Florida graduate and a writer of fiction and poetry. She dabbles in many genres, but particularly enjoys science fiction and fantasy. Her fiction has appeared in Every Day Fiction and The Fast-Forward Festival, and her poetry has appeared in Star*Line. See more examples of her writing at talestotellinpassing.blogspot.com. Poet’s Notes: I wrote this poem as a medley of the happiness and doubt that go with romance, specifically the first. It’s experiencing the ecstasy that blooms in that first moment, that first kiss, wondering how long it will last, realizing it will never again happen in that same way (as no experiences do). Editor’s Note: Ms. July really captures the moment here, that sense of swirling emotions, and that mix of hope and doubt. The last line is particularly strong--gives me chills. 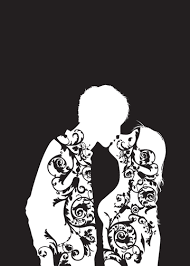 “First (Last) Kiss” was first published in Songs of Eretz Poetry E-zine in November 2013.